Brad has been with Mote Marine Laboratory since June 2004. He assists with many scientific and educational oriented projects in his employment with Mote Marine research and outreach conservation projects. He creates in- house programs for students and manages Mote Marine's educational outreach programs. Brad Tanner graduated from the University of North Carolina at Wilmington, earning a B.A. in Environmental Science. While working on his academic degree at UNC Wilmington, he also worked in the Education Dept. at the North Carolina Aquarium at Fort Fisher. Later, Brad obtained a Masters Certificate in Informal Science Education from the University of South Florida. Brad has co- authored a Marine Science Laboratory Manual, published by McGraw Hill, as a clinical marine ecology education textbook. He has also created a Seashell Identification Guide for use by teachers. His work has resulted in extensively traveling worldwide with Dr. Eugenie Clark (Mote's Founder) On two research excursions to Indonesia; he studied the habits and the habitat of a newly identified fish species. Brad s videotape of these Indonesian research excursions has become a popular presentation precursor. 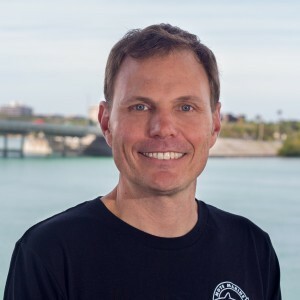 Brad has been a frequent presenter at many national and Florida conferences on effective marine education practices and the translation of scientific research data for school programs uses for greater student and adult learning enhancement. In his civic and community involvement, he serves on the Executive Board for the Florida Association of Science Teachers (FAST) and is a Past-President of that group. For the past 4 years, he has been a member-volunteer on the Sarasota Bay Estuary Program Citizen Advisory Council, a group formed to provide environmental protection to the Sarasota Bay and its wildlife. Mote Marine Laboratory, recently began its 35th year monitoring sea turtle nesting along 35 miles of local beaches.